Each standard room is beautifully decorated in warm, tropical colors, with a private (ensuite) bath and a host of guest amenities including free WIFI, AC, microwave and mini fridge (see our full list of room amenities). Each of these rooms contains either one full sized or queen sized bed. Rates: May 1 thru Sept 30 - starting at USD $68 / Oct 1 thru April 30 - starting at USD $78. 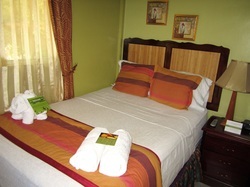 Rates are based on single or double occupancy and do not reflect 6% service charge/processing fee. This room is wonderfully decorated in soothing, tropical colors which creates a inviting, homey feeling. Along with all standard room guest amenities, the room also includes a 32" LG flat screen TV, a full size fridge, 4 burner stove with oven, chopper, blender, microwave, plates and flatware and all major kitchen utensils needed to prepare meals. Rates: May 1 thru Sept 30 - USD $78 / Oct 1 thru April 30 - USD $88. Rates are based on single or double occupancy and do not reflect 6% service charge/processing fee. This unit is an especially wonderful choice for families or groups. It consists of an eat-in kitchenette, and two standard rooms each with a private (ensuite) bath. It is located towards the front of the Inn, overlooking the Roseau River with a a view of the picturesque, historic 'Morne.' Included in this unit are all standard room amenities and in the kitchen is a full size fridge, 4 burner stove with oven, blender, microwave, plates and flatware and all major kitchen utensils needed to prepare meals. Rates: May 1 thru Sep 30 - USD $115 / Oct 1 thru April 30 - USD $130. Rates are based on up to 4 people and do not reflect 6% service charge/processing fee. *Please Note: All rooms, except for the 2-bedroom, are ideally suited for UP TO TWO ADULTS due to the size and arrangement of the space. 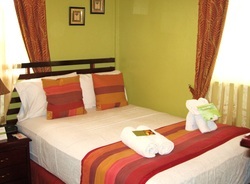 Additionally, the Inn is a two-floor WALK-UP and has a two night minimum stay policy.